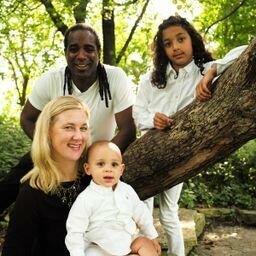 Kathryn Day (lower left) and her oldest son, London (top right). In Australia where Kathryn Day grew up, swimming is a way of life and kids learn to swim when they learn to walk. So understandably, she wanted her son London, 12, to grow up with same love for water play as she did. When Kathryn and her family moved from Philadelphia to Chicago several years ago, she was happy to learn swim lessons were within walking distance from their home at Swift Elementary School, a satellite location for the Chicago Blue Dolphins. They had neighbors whose children had done really well with CBD, and she enrolled London in private lessons so he could learn more quickly. At the time, London was 4.5 years old and Katherine felt they had already lost valuable time getting him acclimated to water. “We had moved here from Philadelphia, and our experience [with swim lessons] in Philly was not as positive as the experience we had with Chicago Blue Dolphins,” she says. At the other swim school they had tried, they felt like a number or like the coaches were not very knowledgeable. Over the years, London has also worked with Coach Elia and now is on the Chicago Blue Dolphins Swim Team with Coach Fitz. The improvements in his swimming and his self-esteem have increased exponentially over the past few years. Kathryn credits the coaching style and the supportive culture of Chicago Blue Dolphin families. London has been with the swim team for about a year and swims with the team two to three nights each week. While the coaches work the kids hard, Kathryn says they also create an enjoyable environment, providing them time to play while still improving their swimming abilities.